Uno is now a Rescuedog! Kidoo Patroldog of the year! The Q's are finally here! So far so good, seven births, seven alive. We hope to keep them all, they seem very healthy. 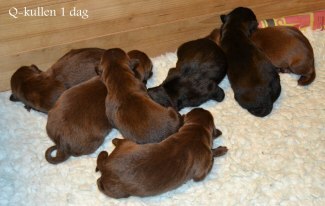 Five boys and two girls, five reds and two blacks. One of the boys (Qrazy Speed) crawled out of the bed immiedatly, therefore the name! 2014 comes with big expectations! Snälla hjälp mig med resultat!!! !